It’s no secret that I love chocolate. Yes, I love candy of just about any variety, but chocolate has a special place in my heart….and in my mouth. 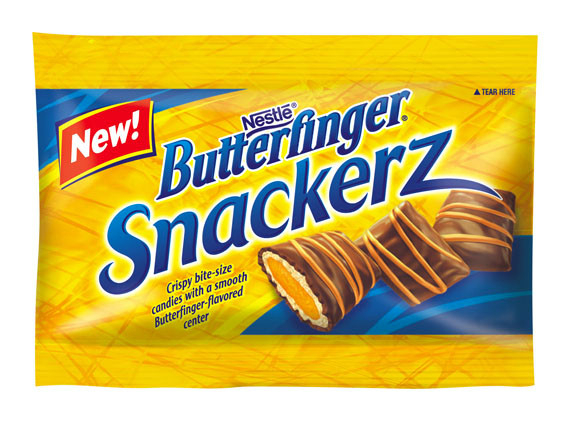 The 87-year-old classic Butterfinger recently launched Butterfinger Snackerz, a new bite-size treat that offers a unique Butterfinger-eating experience. While still “crispety, crunchety, and peanut buttery” like the original Butterfinger, Snackerz are “delicately smooth, refined, and simply irresistible”, as described by some of the nation’s top taste-makers, including celebrities, some of the nation’s leading wine sommeliers, and bloggers. I was lucky enough to be one of those taste-testing bloggers who got a sneak peak of the new Butterfinger Snackerz at BlogHer in August. When I was in New York for BlogHer and I saw an entire booth dedicated to taste-testing a new candy by Butterfinger, I ran right over. And I admit I was not shy about talking about my love for candy in general, pointing out my blogging business card with jars of candy in my logo. I swore that if I had named a son Benjamin his blog nickname would have been Butterfinger for sure. From Butterfinger: At BlogHer, Butterfinger Snackerz became an instant hit with discerning moms and women writers who quickly realized Snackerz were not just a miniature version of the popular candy bar. Moms who also participated in a Snackerz Sommelier tasting at BlogHer, described the benefits of its “convenient take along” size and “easy to share” packaging and then blogged about the “irresistible” and “scrumptious” qualities of Snackerz, with many telling their online readers this was the “must-have” new candy for Halloween 2010. Of course, I wouldn’t be tempting you with pictures of chocolate and words like “irresistible” and “scrumptious” if I didn’t have some to share. In fact, Butterfinger has given me a pack of 24 pouches of Butterfinger Snackerz to give away to one of my readers. All you have to do is tell me what your favorite Halloween candy is. For extra entries, you can tweet daily about this giveaway, follow my blog via Google Friends Connect, or subscribe through RSS (both found in my sidebar). The details: This giveaway will end on Monday, October 25 at midnight and a winner will be selected at random and notified via email. I received a pack of Butterfinger Snackerz to snack on while blogging this week and finished them fast because they were so delicious. And, no, they did not tell me to say that. I’m a big fan of Kit Kats! I love, love, love, love Butterfingers! My favorite Halloween candy is Halloween peeps! I love peanut butter kisses. Oh I love me the Kit Kat’s!! Yum! But I have a comment. 87 years?? Are you kidding me??!! I like Baby Ruth, too much. My favorites are Butterfingers and Reese’s. My favorite it peanut M&Ms. My favorite Halloween candy is Reese’s Peanut Butter Cups, but I’d sure like to try Butterfinger Snackerz :) *Thanks* for the giveaway! I love Snickers & Reese’s Peanut Butter Cups. My favorite is Reese’s pumpkins. My absolute fave is Reece’s Peanut Butter Cups! I don’t really turn my back on ANY candy but, at Halloween, I can’t get enough Candy Corn! I follow you on Friends connect. Butterfingers of course! I love them. And I subscribe to your blogfeed. Thanks! My favorite is mini snickers. I raid the kids halloween candy for them, and they’ve even been know to barter with me for them. hee hee! My fave is Baby Ruth, but Butterfinger, Snickers, anything else with peanuts comes in a close second. And, I am peanut deprived because my son has peanut allergy, but if I win, I promise I could find a secluded spot away from him, and eat them all by myself!! OMG! Butterfinger is my FAVORITE!!! I love Butterfingers…and Reese’s Cups….and Twizzlers….and Skittles….and Tootsie Rolls….and….clearly I could go on all day here. oh I so love so many halloween candies! But I think the best ones are twix! I also love Butterfingers. Luckily the kids don’t like either!